A Turkish newspaper, whose editor has been imprisoned for publishing prohibited truth (that the Turkish government supplies ISIS) has somehow not stopped; his newspaper continues reporting on a court case in which Turkey’s President Tayyip Erdoğan is accused of breaking Turkish law by aiding terrorists. On 1 March 2016, the newspaper, Cumhuriyet, headlined, "Former Justice Minister of Turkey: Erdoğan Will Stand Trial," and reported that, "Former Justice Minister Hikmet Sami Turk, said that Erdoğan's actions ‘do not comply with the decision of the Constitutional Court.’ He criticized [Erdoğan] by saying … ‘One day this matter must be settled by the judiciary’." Russian television had first reported on the case, in English, back on 26 November 2015, headlining, "Turkish newspaper editor in court for ‘espionage’ after revealing weapon convoy to Syrian militants." The Erdoğan government alleged the weapons were "aid to Syrian ethnic Turkmen tribespeople and labeled their interception by local police an act of ‘treason' and ‘espionage’." Turkey is a NATO member, and the famous investigative reporter Seymour Hersh had revealed in the 6 April 2014 London Review of Books, that on 20 June 2013 – just a few months prior to the sarin gas attack that Obama blamed on Assad and used as his excuse to invade Syria – the US Defense Intelligence Agency reported that America’s allies in overthrowing Bashar al-Assad were engaged in "the most advanced sarin plot since al-Qaida’s pre-9/11 effort," but the US Director of National Intelligence denied that it was true. One US ally there was al-Qaeda in Syria, known in Syria as al-Nusra, (Nusra and Erdoğan wanted this gas-attack to provide the excuse that Obama had set as his "red line" to overthrow Assad – a chemical-weapons attack in Syria.) However, Hersh reported, "Last May, more than ten members of the al-Nusra Front were arrested in southern Turkey with what local police told the press were two kilograms of sarin." All of that had occurred prior to the 21 August 2013 sarin gas attack. Hersh subsequently reported that, rather than go ahead with an operation that the Joint Chiefs considered fraudulent, they sabotaged Obama’s policy. On 2 January 2016, Hersh headlined in the London Review of Books, "Military to Military," and he explained how and why they had done this. Obama couldn’t be swayed that the enemy were al-Qaeda and other jihadists instead of Assad – that overthrowing him was his top priority. However, Hersh said in his 6 April 2014 article, that Obama had to backtrack at the last moment anyway, because British intelligence reported to David Cameron that the sarin used in the attack didn’t come from Syria – that it had been imported; this implied that it was a set-up job in order to ‘justify’ invading. Cameron didn’t want to be just another Tony Blair. Obama couldn’t get his necessary-for-appearances’-sake public cover for an invasion, Britain, as his predecessor had done regarding Iraq. Obama was now trapped. He couldn’t fire all of his Joint Chiefs – at least not right away; it would be embarrassing, how could he explain it? And the Republicans were eager to expose his Administration’s disarray on the matter. 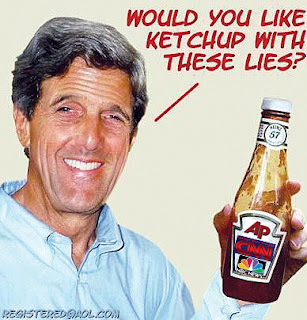 So, the story was passed around that Secretary of State John Kerry got Russia to get Assad to eliminate his sarin stocks. 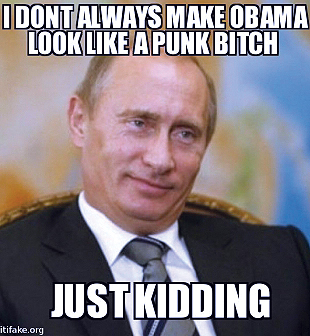 Russia’s leader Vladimir Putin was happy to help Obama avoid invading his Syrian ally. That was how the ‘news’ organizations reported the backtrack – as a rare instance of US-Russian cooperation: good news for everybody. But for Obama, it was actually the way out of a desperately embarrassing situation. And he never gave up his goal of switching Syria from the secular Assad to a failed state whose crucial oil-pipeline routes would be in ‘friendly’ (to Saudi Arabia and Qatar) jihadist Sunni-ruled areas of Syria, so that ‘our’ Arab ‘allies’ (the jihadist-finansiing nations, as even Kerry’s predecessor Hillary Clinton had known them to be) can grab the world’s largest energy-market, Europe, away from Russia. Hersh, in his 2014 article, continued: "The full extent of US co-operation with Turkey, Saudi Arabia and Qatar in assisting the rebel opposition in Syria has yet to come to light… Barring a major change in policy by Obama, Turkey’s meddling in the Syrian civil war is likely to go on." There is simply too much evidence proving that Erdoğan is supporting ISIS and other terrorist groups in Syria. This is the reality of NATO: conquering Russia, first by switching its allies (such as Iraq, Libya, Syria, Ukraine, etc. ), is the assignment, regardless of the public’s safety. Even if the US weren’t backing jihadists directly (which we are), we’re backing them by having jihadist governments such as Turkey and Saudi Arabia and Qatar as allies – instead of as enemies. ‘Our’ oil companies and mega-banks are in bed with them, and their top stockholders and executives, and their lobbyists, control the people who control the US Government. The US Constitution’s "We, the People …" has become only those "People." The rest are now just for extras in crowd-scenes, at political campaign events – and their mass-mind-control is done by their media, ‘our’ ‘free press’ (who don’t report this reality), in ‘our’ ‘democracy’. Erdoğan is profoundly angry at the unsteady support he has been receiving from the US government in their joint efforts to eliminate Bashar al-Assad. However, apparently, Obama doesn’t feel that the US is yet ready for a nuclear war to be sparked between NATO and Russia – Obama thinks that doing it now would be premature. As John Kerry recently said, when responding to aid workers at a donor conference for anti-Assad forces, "What do you want me to do? Go to war with Russia? Is that what you want?" 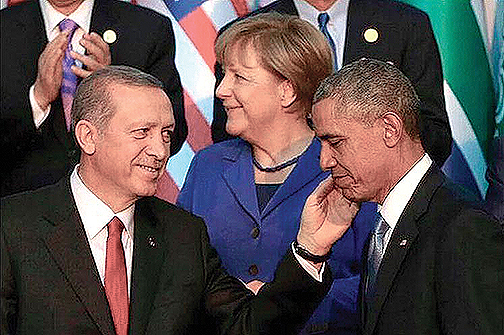 Clearly, Erdoğan is lots more eager for that than Obama is. 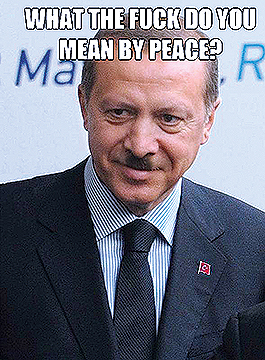 Perhaps Erdoğan thinks that Putin would just back down. American Presidents, however, aren’t so desperate that they feel they need to do it during their own Administration; they can afford to wait until the time is right, even if the plaudits will then go to some future President. So, the American government’s charade goes on. But already an MIT analysis – the Lloyd-Postal report – on the sarin attack that occurred 21 August 2013, stated unequivocally that the Obama Administration was lying through its teeth about the matter. They provided excruciating detail showing why "the US Government’s interpretation of the technical intelligence it gathered prior to and after the August 21 attack CANNOT POSSIBLY BE CORRECT." (That’s a tactful, yet passionate, way of saying: "Obama and his Administration were trying to lie this country into invading Syria.") Yet, Western news-media still simply ignore the evidence (they can do that in this dictatorship), and report that Assad’s forces were behind the sarin attack. It’s still the official reason why we’re at war against Assad. Was even George W Bush worse than this? Anyone who wishes to know more about what motivates the US government regarding Syria should read the astoundingly brilliant article by Robert F. Kennedy Jr., published on an obscure environmental website, February 25th, "Syria: Another Pipeline War." He tells so much suppressed history there, it’s flabbergasting to see it all brought together into one flowing historical narrative. But even a masterpiece can have a flaw: his article plays down the role that leading Democrats after Reagan have been playing in GHW Bush’s long war to conquer Russia. We’re still in the post-Reagan era, just as, between FDR and Reagan, we had been in the post-FDR era. 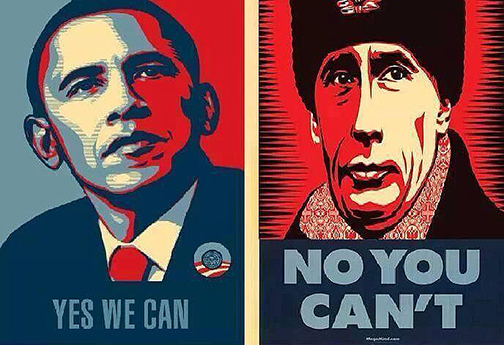 Obama is as rabid a Russia-hater as practically anyone except John McCain would be. If a piece of historical writing is going to be partisan (as almost all are), at least this one is partisan on the less-unacceptable side. I might write RFK Jr.’s name onto the Presidential line of my ballot in November. There’s someone with favorable name-recognition, who clearly has the integrity and depth, and knowledge, to deal with the rot that has overtaken America, if anyone does. Maybe he could win by acclamation, if he wouldn’t be knocked-off first. But if the idea of writing in his name goes around like wildfire in the weeks before the November 8th general election, then who knows what would happen? Certainly, if Hillary is on the ballot as the ‘Democratic’ nominee, I won’t vote for her, though I’m a lifelong Democrat. And I don’t want to be forced to vote for Trump (since he’s almost totally unpredictable – which still isn’t as bad as Hillary). (Besides: Hillary should be in prison for her destruction of crucial public records – State Department emails – to hide her crimes. But the corrupt Obama won’t allow any such prosecutions.) And there’s such beautiful irony here: "Trump: If Elected, I’ll Prosecute Hillary." It’s so much like Ukraine. But no intelligent American can be justified in simply not voting for President. That would be outrageously irresponsible. I won’t ever do that. Every intelligent and caring person must vote for President – not leave that responsibility to others (which would be unpatriotic – plus wrong and callous – for any well-informed voter). The "anyone but ___" non-voters are mere fools and frauds. They simply don’t care enough about the country to do their most-basic civic duty, which is to become informed and then to vote for someone on that basis (though never as a ‘protest vote’ – the nation is too important for any mere ‘protest’ – but only as a real vote, for someone who has an authentic chance of winning the election). Any mere throw-away ‘vote’ is like a non-vote. That article by Kennedy should be linked to by all of his supporters: it tells more about the man than any number of campaign speeches possibly could. It proves that he’s fit for the job, if anyone is. He’s an outsider whose knowledge and understanding of the subject is probably among the best there is, and whose heart is unquestionably in the right place – which would be a refreshing and radical change, a change that’s of a kind needed now more than ever in the US.